We, Axcel gases along with our associated companies are a renowned Acetylene gas cylinder manufacturer, supplier and exporters in India. Acetylene gas cylinders are sometimes referred to as Dissolved Acetylene gas cylinders and D A gas cylinders as well. These are special types of carbon alloy steel cylinders shells, filled with monolithic porous mass. Porous mass is nothing but a chemical substance (Calcium Silicate) having porosity of 90-92 %, in which solvents like Acetone or DMF is being added for further dissolution of Acetylene Gas. 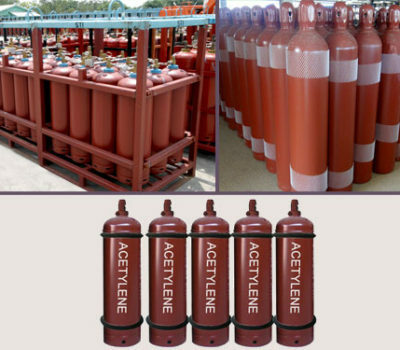 Acetylene is a highly flammable and unstable gas at high pressure and needs to be dissolved in any solvent like Acetone or DMF (Dimethaylformamide). For the safety reasons, generally All the Acetylene Cylinders are equipped with Fusible Plugs, which is nothing but a safety device so that the cylinder does not explodes / blast off in case of fire happened inside the cylinder. Storage of Acetylene without any solvent is not at all recommended due to its highly unstable nature at high pressures. This is a serious safety concern for Acetylene Cylinders to always have enough quantity of solvent to saturate Acetylene gas required to be filled in a cylinder. All the cylinders of Acetylene Gas are as per Indian standards IS: 7312 – 1993 and equipped with cylinder filling permissions issued by CCOE – Nagpur ( Chief Controller Of Explosives – Nagpur , a Department under Central Govt. Ministry of India and BIS(Beauro of Indian Standards). The valves fitted on the cylinders are as per Indian Standard IS: 3224. For the safety purpose, all the Acetylene cylinders are equipped with factory fitted Valve protection guard.Please go through the technical specification chart to know about various types of Acetylene Gas cylinder available. We also supply Acetylene Cylinder quads or cascade as per particular requirement of the customers. Acetylene cylinders are basically of two types, namely Seamless and Welded. Welded Cylinders are cylinders in which Top, Middle and Bottom parts are being made separately and thereafter welded together using Sub merged arc welding as well as Metal Gas Welding technique. This is also called as 3 parts welded acetylene cylinders.